You’ve planned, coordinated, spent long hours on set and in the editing room, and now it’s finally time to premiere your work to friends, family, or film enthusiasts alike. 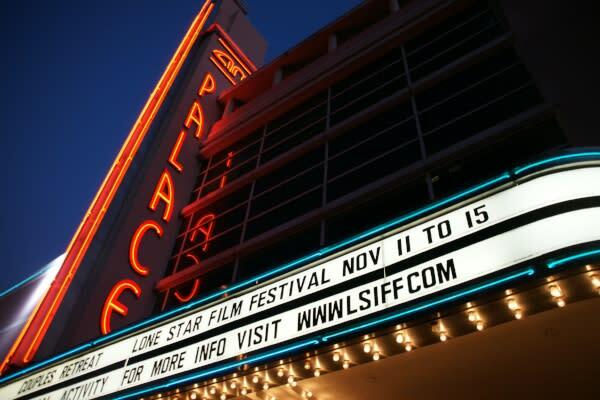 Fort Worth has a great selection of venues to showcase films of any size, style or budget. The Rose Marine Theater, located in Fort Worth’s Northside, opened in the 1920s and is included in the National Register of Historic Places. It has since maintained a legacy of presenting Spanish language films and is the home of Artes de la Rosa, a group that works to preserve, promote, and interpret the art, history, and culture of the Latino community. The Rose Marine Theater seats 250 and has access to dressing rooms, a green room, full box office, lobby area, and loading dock that connects to the stage. There is also an adjacent art gallery. 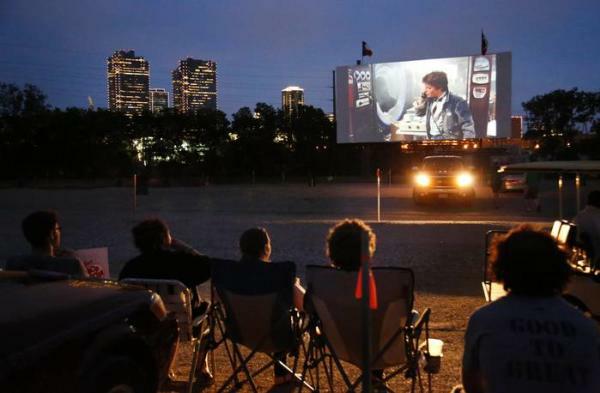 Coyote Drive-In offers the perfect escape for movie-goers as they take in a film under the stars with the glimmering downtown Fort Worth skyline in the distance. The drive-in is a 20-acre property in the Panther Island area. Audience members can enjoy the show from their cars using an FM radio, or can watch from the grassy area in front of the screen. Booking an event at the drive-in is easy, as they offer private screen rental with minimum buy-outs and can accommodate up to 5,000 people. Take the drive-in experience to the next level at the Texas Motor Speedway. Also known as the “Great American Speedway,” the venue is home to Big Hoss TV. The 20,633-square-foot Panasonic screen, with dimensions of 218-feet wide by about 95- feet tall, holds the Guinness World Record for largest HD LED video board. The Speedway can accommodate 200,000 fans for races, including NASCAR and IndyCar events. 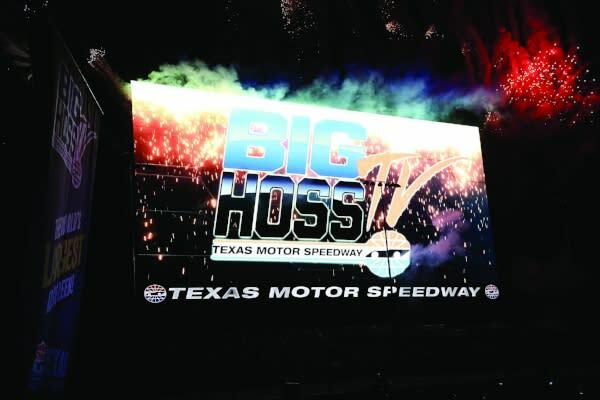 Big Hoss ensures that fans don’t miss a second of the action and shows footage of the stands and interviews from the track. During the summer, the speedway hosts the “Ultimate Drive-In Movie” series and plays films for the whole family. If you’re looking to ‘Go big or go home,’ Big Hoss TV is definitely something to look into. For a more traditional movie theater feel, seek out private rental through companies like AMC Theaters or Movie Tavern. Audience members can relax on the reclining seats at AMC Palace 9 in Sundance Square, which is within walking distance of popular restaurants like Del Frisco’s Grille, Flying Saucer Draught Emporium, or Bird Cafe. The Movie Tavern on Crockett Street in Fort Worth’s West 7th is another great option and offers in-movie service which includes a full food and drink menu and waiter that brings orders to your seat. If you would rather skip the concessions, visit nearby Rodeo Goat for a gourmet burger, grab a drink at Social House, or indulge in a sweet treat at Steel City Pops after the show. 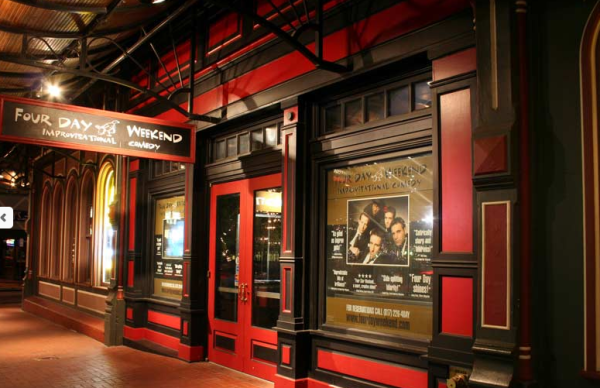 The Four Day Weekend comedy group performs interactive, improvisational shows each weekend out of their theater in Sundance Square. Private rental allows access to the 212 seat A/V capable theater, which is equipped with microphones, a projector and screen. Renters can also utilize the main lobby and full bar space as well as the Encore Lounge Party Room, with overhead speakers and sound system. This venue was designed for presentations and videos which makes it a perfect location for screenings. 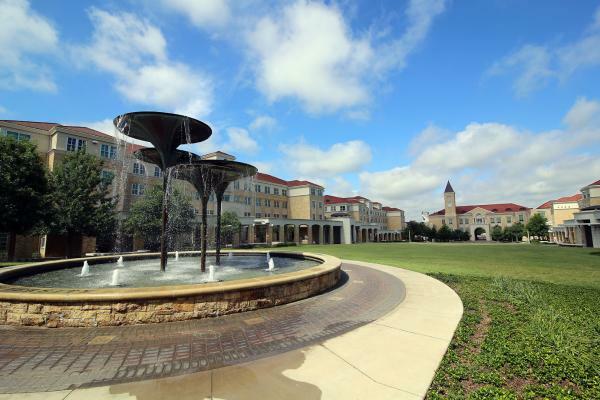 Texas Christian University is a central part of the Fort Worth community. The campus is used to accommodating groups of all sizes and needs and has many venues available for rent. The Brown Lupton University Union (BLUU) is at the heart of campus, with views of the Commons and Amon G. Carter Stadium. The BLUU Ballroom can fit up to 802 people and can be divided into smaller rooms if needed. It has a stage, two large screens, and the school’s signature purple color scheme. The BLUU Auditorium seats 306 people and has a separate lobby area with a piano. These rooms include A/V support including a video projector and microphone at no additional cost. If over 50 percent of the audience is TCU students, faculty, or staff and the event is hosted by a student organization or University department, rental is available at no charge. Contact TCU Conference Services at 817-257-7641 for more information or to make a reservation. Fort Worth’s Cultural District has multiple internationally-recognized museums in a beautiful, park-like setting. There are often featured film screenings at the Modern Art Museum, Amon Carter Museum of American Art, Kimbell Art Museum, and the Museum of Science and History. The Modern frequently plays a variety of indie, art, and international films, and the Amon Carter screens movies during their Sunset Cinema series where audience members picnic on the museum’s lawn. At Fort Worth Museum of Science and History, regular screenings are presented in the Omni IMAX Theater, as well as in a special 4-D theater. A museum can create a wonderful atmosphere for your film screening. Originally from Las Vegas, Taylor left the bright lights to attend Texas Christian University where she studied film and advertising. 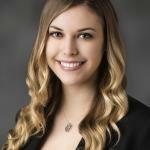 Taylor enjoys working for the Fort Worth Film Commission as well as dancing at Billy Bob's, catching the latest movie, taking spin classes and spending time with friends.